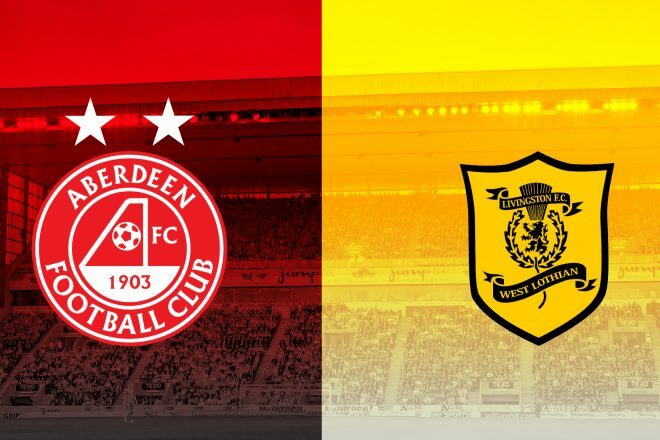 Aberdeen return to league action this Saturday as they face Livingston at Pittodrie. Fresh off their excellent displays in Glasgow, where they earned a point at Celtic Park before beating Rangers in the Scottish Cup quarter-final replay at Ibrox, The Dons put their attention on the league as they look to close the gap on their rivals at the top end of the table. Now with a Scottish Cup semi-final date pencilled in the diary Aberdeen will look to pick up some valuable points as they look to get their home form back on track following a difficult spell at Pittodrie. The visitors, Livingston, who have had a very strong first season back in the top division, currently occupy 8th place in the table and will still harbour ambitions of sneaking into the top six despite being five points off Hibernian and don’t need to worry about the threat of relegation being 19 points clear of the play-off place. On Friday morning Derek McInnes and Stevie May spoke with the media ahead of the match. “I can’t pretend it’s been what we wanted and how we normally have it here. I think what is clear when we’ve lost the first goal we’ve been chasing the game. The league game against Rangers, the game against St Mirren and the game against Hamilton. Normally we’ve got to be in charge of the game here and we’ve chased the game and ultimately left ourselves open. Saturday marks the 31st meeting between the sides and it’s The Dons who have the slightly better record with thirteen wins compared to Livingston’s nine. There have been eight draws with the last coming back in 2005. There have been 37 goals for Aberdeen. This will be the third occasion the teams have met this season and they’ve been close affairs with Aberdeen narrowly taking the points in both games. The first meeting came in December as Livingston played their first league match at Pittodrie since 2006. The Dons got off to the perfect start when Niall McGinn timed his run to perfection as he volleyed home Cosgrove’s cross after nine minutes. The lead didn’t last long and despite their strong start Aberdeen allowed Livi in with a long ball over the defence. Sibbald forced Lewis into a stop, but Pittman followed up to equalise. The hosts went looking for a response, but it was the visitors who took the lead when McMillan slotted past the Aberdeen goalkeeper and The Dons had it all to do. Connor McLennan was introduced at half time and it was his presence that ultimately won Aberdeen the game. Playing out on the right the tricky winger beat his man to the byline and fired across goal which Cosgrove accepted on a plate to level it up once again. The Dons pushed for the winner and were camped in the opposition half. 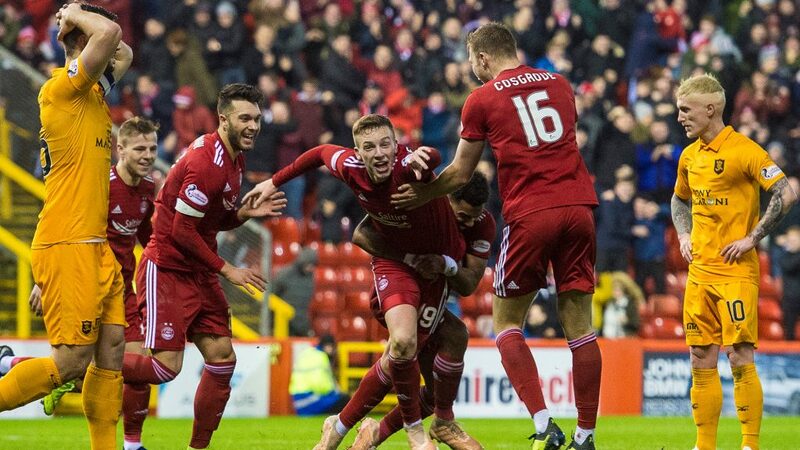 With the clock running down Aberdeen won a corner in which Kelly failed to clear his lines and Lewis Ferguson scooped an overhead kick into the net from six yards, giving the men in red a huge win that seemed unlikely. A strong and vocal Red Army descended on West Lothian to see if The Dons could round off 2018 in style. It was a largely uneventful first half and The Dons huffed and puffed to create an opening despite being hampered with a thin squad becoming further depleted thanks to injuries to Shay Logan and Bruce Anderson. Ultimately it was James Wilson who made the impact and he diverted a Gleeson goal bound effort on target and past Kelly with 20 minutes on the clock remaining. The goal sparked fantastic scenes amongst the travelling support and they were celebrating again five minutes before the end when one of their own, Dean Campbell got the slightest of touches to bundle home after James Wilson made a rampant run down the right hand side. The hosts had proved to be a tough nut to crack at the Tony Macaroni Arena and they made it a nervy ending when Hardie scored just before the 90th minute. Thankfully for The Dons Livi ran out of time and Aberdeen picked up three more points, an unbeaten run that they’re still on. Livingston had been missing from the top flight in Scotland since their relegation in 2006, but ever since they came in to the Scottish League in their early years, they’ve held the upper hand over the Dons. The media love an underdog and for a couple of seasons, the Dons just could not shake off an emerging Livingston side. It all began when the new West Lothian club were storming their way through the Second Division and came to Pittodrie in January 1999 and knocked the Dons out of the Scottish Cup. Paul Hegarty was in charge of the Dons at that time and although the former Dundee United defender instilled some passion in to the side, it was going to be a long way back for Aberdeen following a disastrous spell under Alex Miller. Two years later, little had changed and they repeated their smash and grab act in the same competition. A solitary Scott Crabbe goal was enough to win the tie – it was all the more frustrating for the Dons as a home quarter-final tie against Peterhead was the prize. What was almost certain to be a virtual sell-out at Pittodrie against their nearest league neighbours never materialised. Sandwiched in between those games was Ebbe Skovdahl’s first ever cup tie in charge of the Dons. On 17th August 1999, a goal from Ricky Gillies helped the Dons to a 1-0 win in the CIS League Cup. Aberdeen went on to defeat Rangers that year, before losing in the final to Celtic. In October 2001, another CIS Cup game at Pittodrie had the hoodoo headlines to the fore once more. 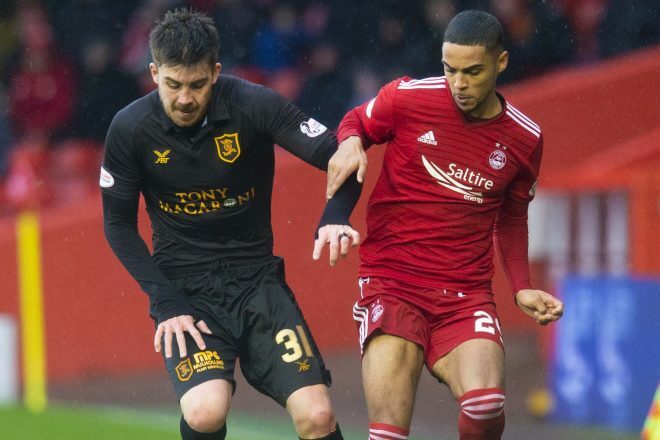 Livingston’s amazing season continued as they swept aside Aberdeen and piled more pressure on manager Skovdahl. It was the third time in three years that the West Lothian side had knocked Aberdeen out of a cup competition. The previous two were by single-goal victories while Livvy were in the lower leagues, but doubles from Barry Wilson and Massimilianio Caputo before the break and further strikes from Stuart Lovell and David Bingham ensured an emphatic 6-1 win this time for the Scottish Premier League newcomers. Darren Mackie got the sole consolation for the dismal Dons. It was not until Livingston regularly cut their teeth in the SPL that Aberdeen began to rid themselves of what had become their bogey side. The only blemish in those years on an otherwise faultless report card was a 3-0 defeat at Pittodrie in January 2002. Aberdeen had won nine home league games in succession, a run that was eventually to produce a UEFA Cup place. Aberdeen gained ample revenge on Livingston when the sides clashed at Pittodrie on 20th April 2002. It was decision time as European football beckoned for both. The Aberdeen incentive was clear; a win over their West Lothian rivals would guarantee European football. To add to the occasion, the club paid tribute to manager Skovdahl and international keeper Peter Kjaer by designating the match as ‘Danish Day’. 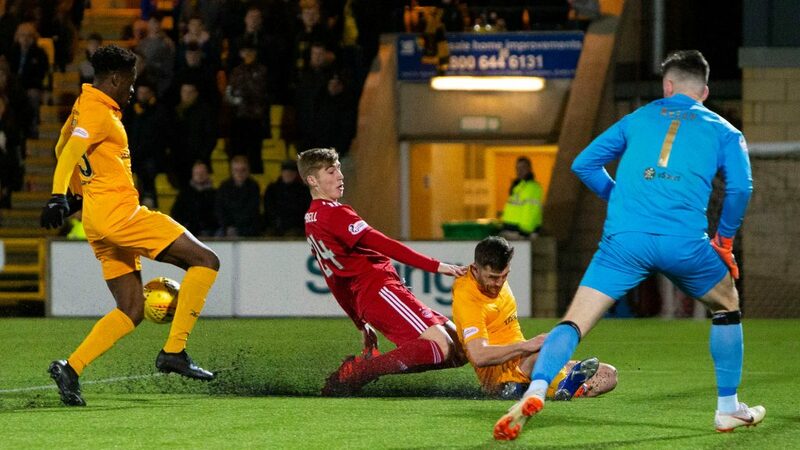 More than 14,000 turned out to see Aberdeen cut through a nervous Livingston defence as goals from McGuire, Mike and Mackie piled misery on Livingston who were now showing signs of fatigue in what was their first season in the top flight. In 2002/03, it was more of the same from Aberdeen as they remained undefeated against Livingston in all matches. In December, it was Steve Paterson’s first game in charge at Pittodrie and a 0-0 draw was as uninspiring as the score suggests. 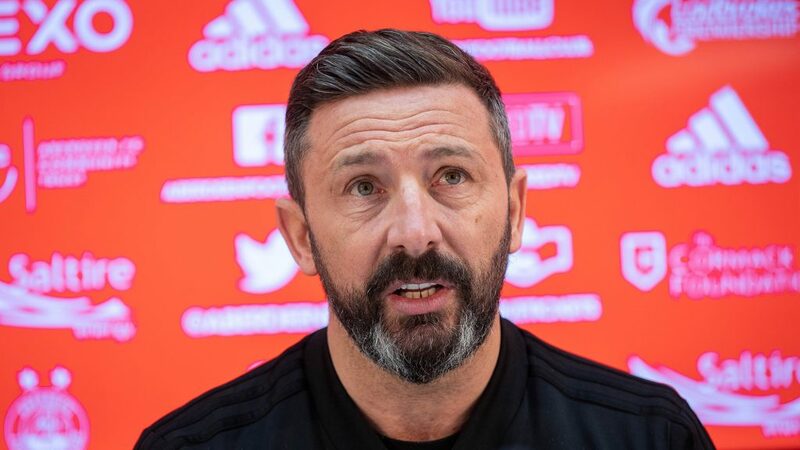 Aberdeen had slumped during the closing weeks of Skovdahl’s reign and the wave of optimism that swept through the support for Paterson and Shearer was not lost on the new Aberdeen manger. Paterson readily admitted after watching his side struggle to break down a stubborn Livingston side that he did not realize the enormity of the task at Pittodrie. That apart, Aberdeen inflicted three defeats on Livingston, the last of which was the narrow 1-0 win in April 2003 – it was a first Aberdeen goal for Leigh Hinds that was enough. In 2004 Kevin McNaughton scored his first goal for the Dons and that proved to be a crucial winner in a 2-1 win. Before Livingston were relegated in 2006, the Dons were undefeated in all three league meetings, the highlight being a 3-0 win in March 2006, the last league meeting between the sides. Goals from Russell Anderson, Steve Lovell and Ferne Snoyl kept Aberdeen in the hunt for a European place. In September 2014, after a eight year gap, Adam Rooney scored a hat-trick as the Scottish League Cup holders began the defence of the trophy with a comfortable win over Livvy. The Dons got off to the best possible start with Ashton Taylor heading his first goal for the club from Nicky Low’s cross. Rooney hammered in a second after a back-heel from David Goodwillie and then netted another shortly after. The hosts continued to impress and Rooney completed his hat-trick late on. Aberdeen have not lost to Livingston since April 2004 but there have been some very tough games against the West Lothian side. Tuesday’s win at Ibrox means The Red Army have a day out at the national stadium to look forward to next month. In the meantime, there’s four important league games to be played with Livingston first up. After the international break, which sees Graeme Shinnie, Scott McKenna and Niall McGinn jet off to represent their countries, The Dons face Hearts at Tynecastle in a match that could have a huge baring on where either side finishes in the race for European football. Motherwell travel to Pittodrie four days later before the reds make the short trip to Dens Park to face Dundee ahead of the semi-final with Celtic. If you can’t make the game then you can tune into our RedTV coverage from 2.45pm. Dave and Andrew will be joined on the air by former player Walker McCall with UK subscribers receiving live audio. RedTV International subscribers will be able to watch the game and post-match we’ll have reaction, goals, highlights and a full match replay. A first half strike from Niall McGinn wasn’t enough to take all three points on a dreich day at Pittodrie. A few minutes later McLennan had an opportunity of his own to test the keeper when Cosgrove showed great strength to hold off his marker and play the winger in. McLennan’s strike had plenty of power on it but not enough direction to beat Kelly at his near post. It wasn’t too long before The Dons were back on the front foot, Lowe picking out Cosgrove in the area with a cross from the left. The striker met the ball on the volley but had too much to do to get the ball on target with his left foot and subsequently the ball drifted wide of the post. Livingston looked to be through on goal again when Pittman broke free from Ferguson but Ball got across to recover and force the ball out for a corner. It wasn’t really happening for Aberdeen and in the 56th minute they made a change when Campbell replaced May, perhaps to bring a bit of control to a game that was being dominated by long balls and aerial duels. The home side had greater control of the ball after the introduction of Campbell but couldn’t create any clear-cut opportunities. With 20 minutes remaining McGinn was replaced by Stewart in an effort to try and supply the final ball that had been missing for most of the match. In the first minute of added time a cross from Lowe deflected into Stewart’s path on the 18-yard line but his shot was deflected wide of the post. It was the best opportunity that The Dons would get as the match finished level.